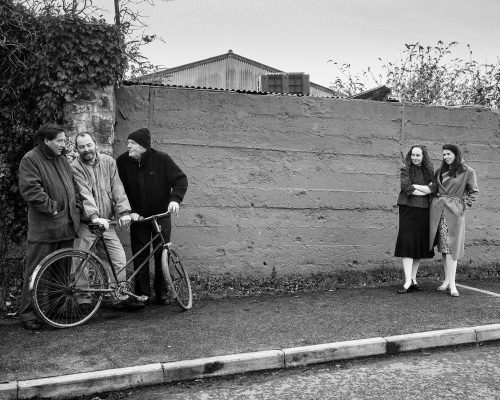 Following their sell out tour with Lucinda Sly, Mend & Makedo Theatre Co return with Corner Boys, written by John MacKenna and directed by Marian Brophy. The time is 1963. The place is an Irish village. For the two young women working in the local drapery shop the visit of John F Kennedy is all important but for the corner boys the concerns are different – women, money and darker doings fill their lives. John MacKenna’s play met with rave reviews when first staged ten years ago. This powerful play exposes the light and dark of Irish life in the sixties – the carnivals; the sodalities; the humour and the desperation. Corner Boys is intended for an over-16 audience. ‘A wonderful piece of work – catches that time and that way of life perfectly’ (RTE Radio 1). ‘A powerful, funny play with a dark twist in the gripping tale.’ (The Nationalist). This entry was posted on May 9, 2016 by waterfordarts in Garter Lane, General, theatre, Waterford City and County Council and tagged Arts & Entertainment, Arts and Entertainment Waterford, Corner Boys, Garter Lane Arts Centre, waterford arts, Waterford City, Waterford Entertainment, waterfordarts.com.